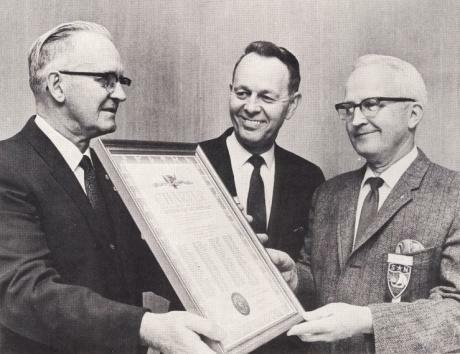 The Sons of Norway lodge, Norse Valley was founded by a group of ambitious people in1969 who canvassed the northeastern part of Wisconsin, especially the Appleton and Fox Valley area, with the intention of finding eager lodge members. From the time when organizing began to a year later the lodge had been organized, officers installed, and 134 enthusiastic members were recruited. The first lodge president was Everett Lee, a long time principal at Roosevelt Junior High in Appleton. He did much of the ground work in creating the lodge. In the First Anniversary issue of ÅRBOK the president, Everett Lee, gave the following report. "In this day and age of escalating figures, the Sons of Norway, Norse Valley Lodge #491, has been no exception. Once the publicity had been issued, and the forty required members had been contacted, many more phone calls, letters, and referrals from others have been coming in, almost unsolicited. Willingness to serve on committees and as officers has been equally fantastic. I have never ceased to marvel at the fact that a past supreme president came into our lodge and is our never-failing counselor.…. the fellowship that we have found on a local basis and the enthusiasm that prevails in these first stages of our lodge has made this one of the most interesting and rewarding years I have experienced." In the first year there was a Lutefisk dinner, plans for a trip to Stoughton and a booklet to mark the first anniversary, as well as regular meetings. In September 1970 the first Nytt I Bygda (news of the area) was started and sent to all members of Norse Valley Lodge monthly thereafter. This publication notified members of meetings and events. There was a list of new members, and birthday wishes, a tradition that is still going. There was also a column called “This and That,” news about members. In 1971 there was notification of a scholarship for the International Summer School program in Oslo Norway. Mary Lee, from Norse Valley, received the scholarship that year and spent the summer In Norway. After returning home she gave an interesting program to the lodge members. The lodge offered a scholarship for a Norwegian Language Camp held for children ages 9-17 in Bemidji, Minnesota. In addition there were language classes for adults at Fox Valley Technical College. In 1971 if you wanted to speak Norwegian locally there was a meeting at the YMCA at lunch time. Cross country skiing started and classes were held on Tuesday. Actual skiing, under supervision, was on Sunday afternoons at Reid Golf course. The lodge volunteered in the Highway Wayside’s cleanup program every spring. A cookbook committee was anxious to get recipes for a cookbook to be sold at Christmas. The lodge supported the Tubfrim project to collect stamps to help children with tuberculosis in Norway. It was indeed an exciting and busy time. Some of the areas in Norway that lodge member families came from were Bergen, Gudbrandsdal, Hallingdal, Hiddal, Hitterdahl, Hodeland, Lillehammer, Oslo, Romsdal, Skien, Stavanger, Telemark, Trondheim and Voss. Original charter members who are still members include Norma Czarnick, John and Yvonne Gurholt, Arleigh and Herbert Hamel and June Wrolstad.